Karina's Kreations: SAB 2015 A Happy Thing Sneak Peak! SAB 2015 A Happy Thing Sneak Peak! I'm so happy to share this sneak peak with you today. I love how this card turned out!!! My card uses the new A Happy Thing stamp set. 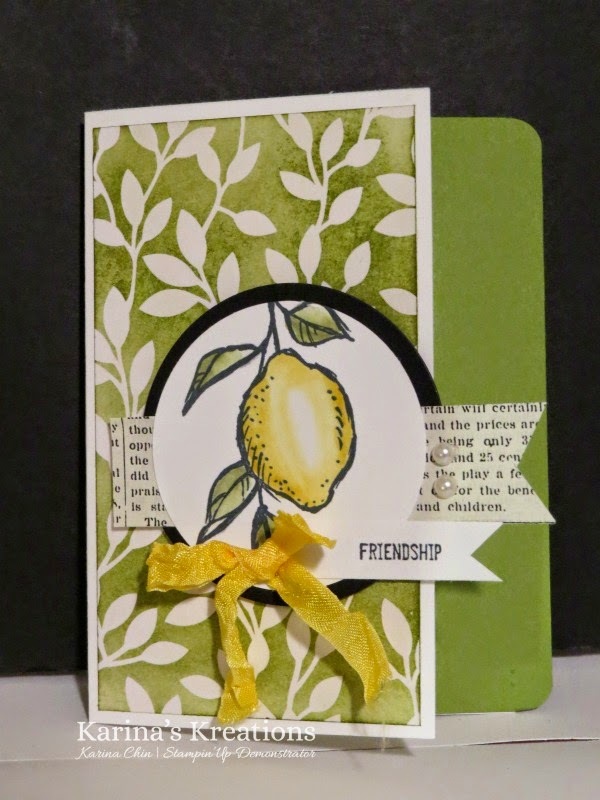 This set has a lemon and hummingbird image and can be yours for free with a $60.00 order starting Jan 6th! Or if you can't wait that long, get the starter kit and get it for free with your first order. Do you love the background paper? It's also a Sale-a-bration item called Irresistibly Yours. Each sheet has a glossy white designed embossed into the paper. Just sponge some ink over top and the pattern appears. It's like magic!!! The lemon was colored with Blendabilites markers that you can also get for free as a sale-abration item or you can purchase them.